Variation in chromosome number study has enhanced our knowledge of evolution. Monosomy and trisomy in both plants and animals have made it clear that the diploid genome expresses genetic information in a delicate balanced way. In humans, this equilibrium of genetic expression is much important as loss or addition of even one chromosome may prove lethal or severely affect the development of the individual. Although the plant aneuploids survive better then animal aneuploids but these are not successful much and do not play important role in plant evolution. Polyploidy is relatively common in plants than in animals. Naturally formed Autopolyploids are more adaptive and those with even number of haploid genomes are quite successful in sexual reproduction. The majority of plant genera contain one or more successful polyploidy species. Related species usually contain multiples of common number of chromosomes, e.g., Chrysanthymums have species with 7, 14, 21, 28, 35 and 42 pairs of chromosomes. Also, Triticum exists in diploid, triploid, tetraploid or hexaploid varieties. Allopolyploidy plays a significant role in the formation of new species. Allotetraploids exhibit more phenotypic variations than the parental species and reproduce successfully. Experimental production of these varieties have played an important role in agriculture. Certain cells in an otherwise diploid organism have been observed to be polyploidy. 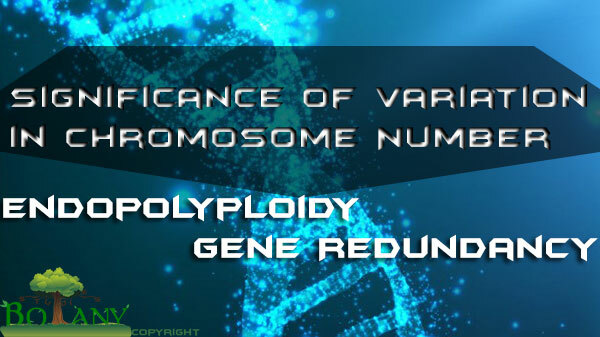 The term Endopolyploidy describes this general phenomena. In endopolyploidy, replication and separation of chromosomes occur without nuclear division. The process leading to endopolyploidy is called Endomitosis. The stem and parenchyma tissues of apical regions of flowering are often endopolyploid. Vertebrate liver nuclei including human ones, often contain 4n, 8n or 16n chromosome sets. Although, the role of endopolyploidy is not clear, the proliferation of chromosome copies often occurs n cells where multiples of certain gene products are required. In fact, it is well established that certain genes, whose product is in high demand in every cell, exist naturally in multiplies copies in the genome. This general phenomenon is called Gene Redundancy. Thus, the diploid cell has built in it multiple copies of some essential genes. Ribosomal and transfer RNA genes are examples of multiple-copy genes.